Ah, lazy Sundays. For some, this well-cherished day of the week is exciting for a reason besides relaxation — one that involves scissors and careful planning: weekly coupon inserts. If you’re a Penny Hoarder, you might be into couponing, even if you’re not extreme. Everyone knows how awesome coupons can be for reducing your grocery bill, but you can only get so many of them. Is it possible to get more? I’ve seen coupons listed on eBay, and there are websites that actually sell coupons. This got me thinking: Can you really buy and sell coupons? Is it OK to Buy Coupons? I spoke with Bud Miller, executive director of the Coupon Information Corp. (CIC), a nonprofit association that fights coupon misredemption and fraud. 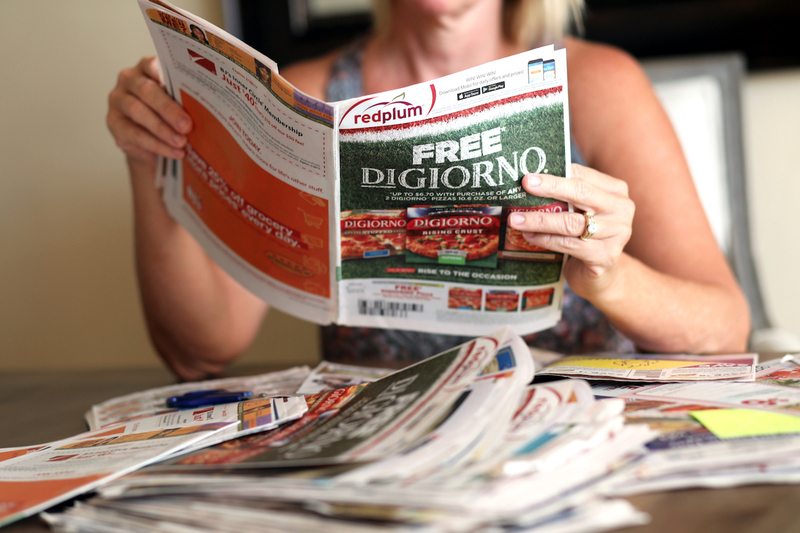 “Consumers should never pay money for coupons. Period,” he said. All coupons have a non-transferability clause stating they are “void if transferred, bought, sold, traded, exchanged for cash, other coupons, or certificates,” says The Balance. You don’t have to take The Balance’s word for it — just look at any coupon and read the fine print. Being in violation of this clause means the coupon is void. Redeeming a voided coupon is considered redemption fraud, which is punishable by law. Although there aren’t any laws specific to coupons, redeeming voided or altered coupons falls under fraud and misrepresentation. Miller says once a customer redeems a voided coupon, it becomes a civil issue between the manufacturer, the seller of the coupon and the consumer who purchased the coupon. Although it’s unlikely the issuing company would find out you are using a purchased coupon or pursue legal action against you, you still shouldn’t redeem a coupon that’s supposed to be void. The rules are in place for good reason — to protect consumers, manufacturers and grocery stores. Do You Really Know Where That Coupon Came From? When you purchase coupons online, there’s no way to ensure they aren’t stolen or counterfeit. In 2015, authorities arrested four South Carolina residents and charged them with second-degree burglary and larceny for allegedly stealing garbage bags full of coupons from a local newspaper distribution center to sell them online to unsuspecting super-couponers. In 2012, a woman from Arizona was arrested for “the largest counterfeit-coupon enterprise in U.S. history,” according to local officials. She spent two years in prison and was ordered to pay $5 million in restitution. Miller worked with law enforcement on this case, in which authorities seized $40 million worth of counterfeit coupons. Phoenix police also seized more than $1.1 million in assets. Redeeming a stolen or counterfeit coupon also constitutes fraud. The retailer, ultimately, is the victim because it loses out on the money from the product. Consumers should also be cautious about whom they provide their information to, Miller warns. When you purchase coupons, you’re providing your name, address and financial information. Supplying this info could make you vulnerable to criminal activity, such as identity theft or credit card fraud. Is it OK to Sell Coupons? Some coupon-selling sites claim to have found a loophole to these rules by saying they’re charging money for the “service” of clipping and mailing coupons rather than selling coupons themselves. This way, you technically aren’t buying a coupon, and they aren’t selling it, so the coupon should still be valid. Miller said the workaround originated on eBay, “and it caught on, making people think it was a magic phrase.” These disclaimers are invalid, he said, and don’t carry any weight. Shows like TLC’s “Extreme Couponing” set a high — and frankly unachievable — bar for the crazy discounts you can get just by using coupons. For example, say there’s a coupon for $1 off of a $4.99 six-pack of iced tea. But instead of purchasing the six-pack the coupon is intended for, you use a known “glitch” to redeem the $1-off coupon on a 99-cent bottle of iced tea and essentially get the item for free. Turns out, a few of the show’s contestants allegedly redeemed counterfeit coupons they purchased online. They also used another newer black-hat couponing tactic called bar code glitching, which occurs when consumers exploit errors or weaknesses in coupon bar codes to redeem coupons on items the manufacturer didn’t intend them for. As you can see, the types of discounts you see on “Extreme Couponing” aren’t based in reality, they’ve been fraudulent at times, and thet should be taken with a grain of salt. I mean, aren’t we past thinking reality TV is actual reality? Buying and selling coupons violates the manufacturer’s terms and can constitute fraud. Not only does the sale or transfer void the coupon, but you also don’t know if the coupons are even legitimate. Miller says buying coupons hurts everyone. Manufacturers have to add more security to to catch coupon fraud, and retailers have to spend more time looking over every single coupon. Because fraudulent coupons cost companies money, they can also result in the loss of jobs on the manufacturer’s end and less generous coupon offers, which affects consumers. Companies also invest lots of money in market research that involves test distributions coupons to specific areas. If people sell these coupons, the test will fail, causing the company to either pay to redo the test or scrap distribution of the coupons altogether. This doesn’t mean you can’t find legitimate coupons online: One of our favorite sites is Coupons.com. You could also grab coupons from your local grocery store, directly from the brands or from any of these 99 places to find coupons. And all of these resources are free, as coupons should be. Stay safe out there Penny Hoarders, and happy couponing!